, a Roman catholic divine, and author of some works of considerable merit, was descended from an ancient family. His father was a Roman catholic, but had become a convert to popery. 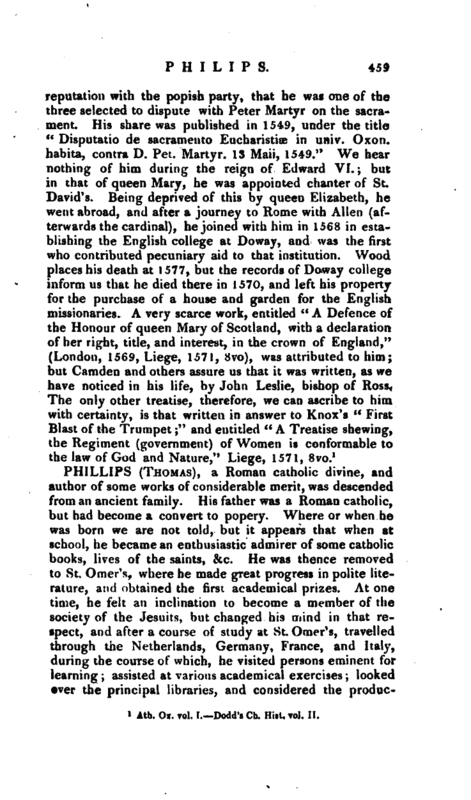 Where or when he was born we are not told, but it appears that when at school, he became an enthusiastic admirer of some catholic books, lives of the saints, &c. He was thence removed to St. Omer’s, where he made great progress in polite literature, and obtained the first academical prizes. At one time, he felt an inclination to become a member of the society of the Jesuits, but changed his mind in that respect, and after a course of study at St. Omer’s, travelled through the Netherlands, Germany, France, and Italy, during the course of which, he visited persons eminent for learning; assisted at various academical exercises looked over the principal libraries, and considered the | productions of the polite arts, and those magnificent structure* which ancient and modern piety had raised and dedicated to public worship. He observed the different face and product of each country, and that endless variety of manners which seems merely or principally to arise from clU mate and education. He did not trust his remarks to memory alone, but committed them briefly to writing; but whether they are now existing, we are unable to ascertain. Having finished his travels, he determined to devote himself to the ministry, and accordingly was admitted into orders. Soon afterwards his father died, but his perseverance in his religious sentiments deprived him of the estate he would otherwise have enjoyed: Thus, though an eldest son, he had no other provision but what the frugality of his parents had made for him. This however was something more than mediocrity, and placed him above dependence. 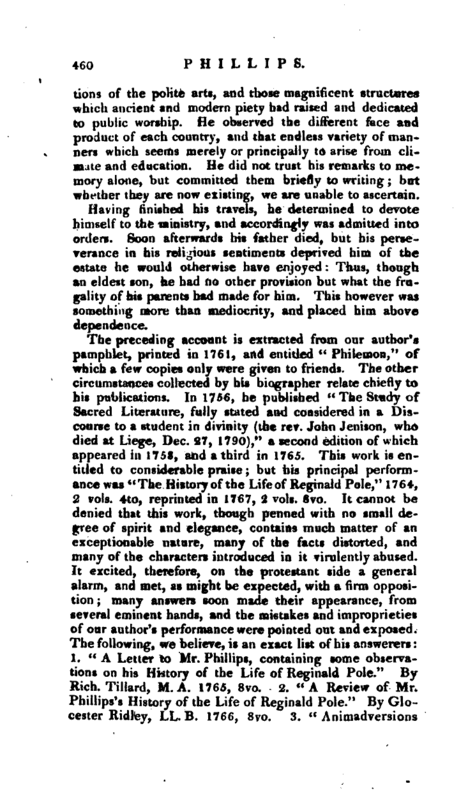 In vindication of himself he published in 1767, an “Appendix to the Life,” with some remarks on the chief objections which had been made to it and at the end of the third edition of his “Essay on the study of Sacred Literature,” he added some strictures on his opponents, and some corrections of mistakes. 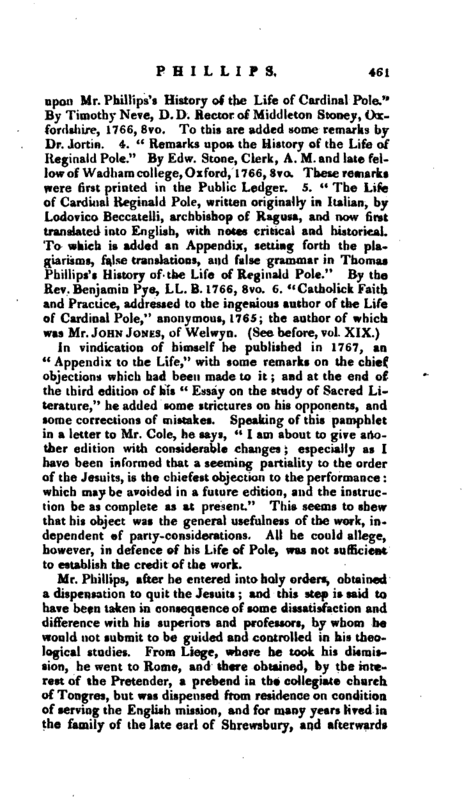 Speaking of this pamphlet in a letter to Mr. Cole, he says, “I am about to give another edition with considerable changes; especially as I have been informed that a seeming partiality to the order of the Jesuits, is the chiefest objection to the performance: which maybe avoided in a future edition, and the instruction be as complete as at present.” This seems to shew that his object was the general usefulness of the work, independent of party-considerations. All he could allege, however, in defence of his Life of Pole, was not sufficient to establish the credit of the work. Mr. Phillips, after he entered into holy orders, obtained a dispensation to quit the Jesuits; and this step is said to have been taken in consequence of some dissatisfaction and difference with his superiors and professors, by whom, he would not submit to be guided and controlled in his theological studies. From Liege, where he took his dismission, he went to Rome, and there obtained, by the interest of the Pretender, a prebend in the collegiate church of Tongres, but was dispensed from residence on condition of serving the English mission, and for many years lived in the family of the late earl of Shrewsbury, and afterwards | in that of Mrs. Berkeley, of Spetchley, near Worcester. In the decline of life he retired to the English college at Liege, with the design, which he could not effect, of reentering into the society he had withdrawn himself from, for which he retained a tender regard and affection. During the last four or five years of his life he was afflicted with epileptic fits, and, as his temper was naturally eager, his friends were cautious not to engage him in conversation upon his past studies or literary subjects, by which they observed his infirmity was increased. 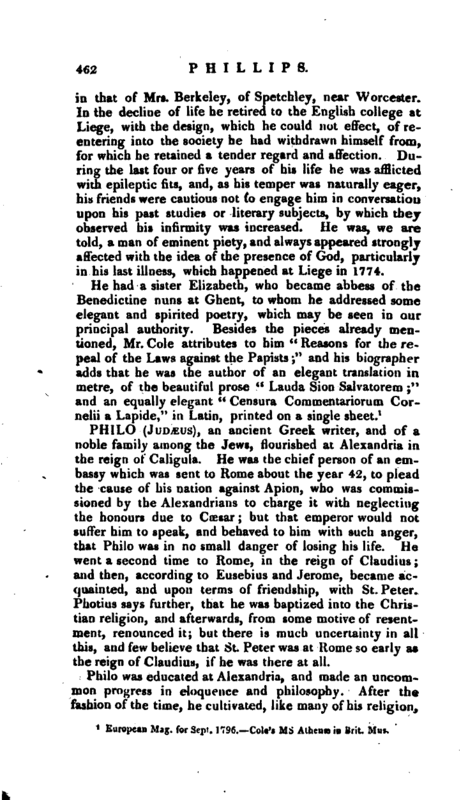 He was, we are told, a man of eminent piety, and always appeared strongly affected with the idea of the presence of God, particularly in his last illness, which happened at Liege in 1774. European Mag. for Sept. 1796. -Cole’s ms Athens in Brit: Mus.